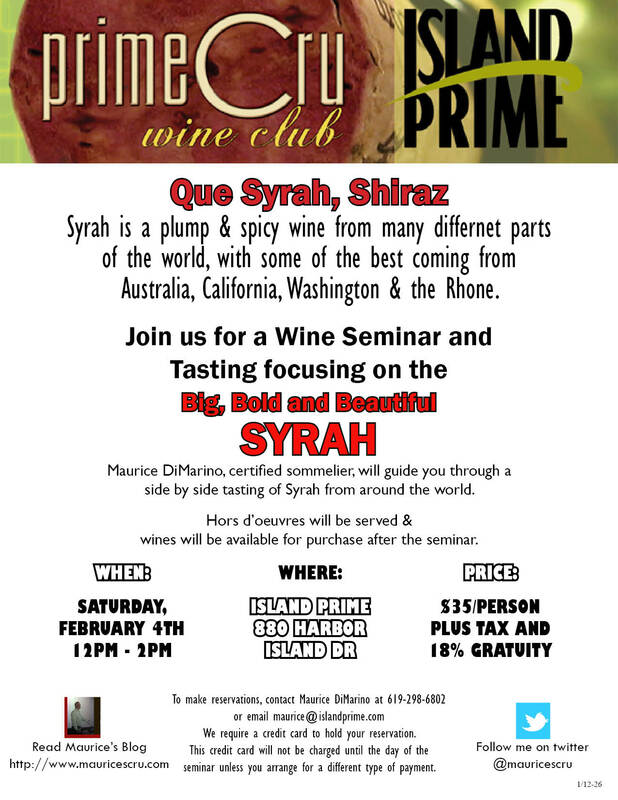 At Island Prime & C-Level I have created a wine club Prime Cru in which members get a chance to take part in special events. I conduct tastings, wine dinners, seminars and wine sales. It’s easy to register for the club and it is completely free. I really enjoyed the Syrah seminar yesterday. It was one of my favorites so far! It was so interesting to learn about (and taste) the differences between the different regions. I also learned how much I really like Syrah! 😉 Thanks, Maurice! I am glad you had a good time. It was so interesting to see the vast differences from region to region. I’m glad I turned you on to Syrah, it has so much diversity. 7 years ago I thought it was going to be the next big thing, but Malbec bumped it off its course to stardom. I guess that is a good thing, because people who make Syrah will make good Syrahs, unlike those that jumped on the Malbec bandwagon. Hope you can make the next one. Cheers!